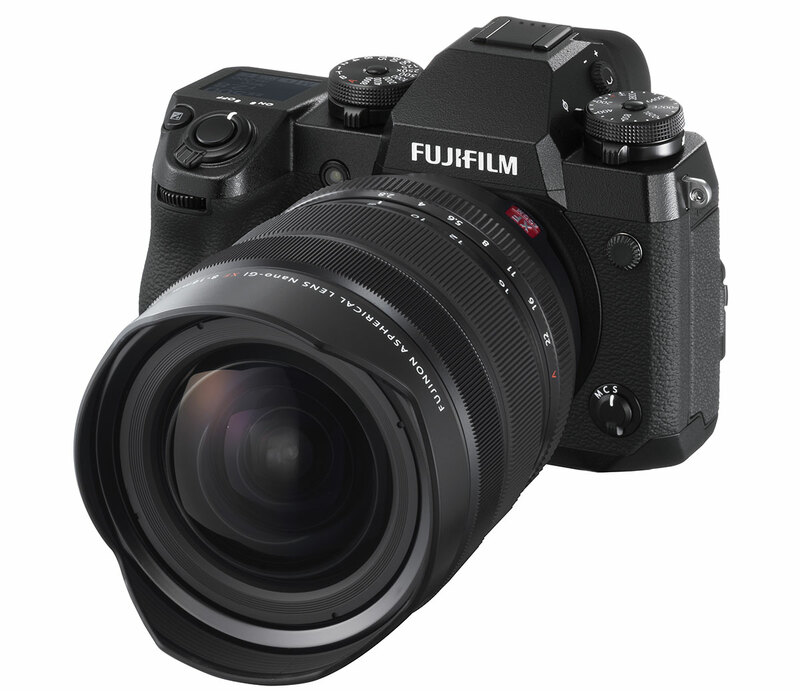 Valhalla, N.Y., July 20, 2018 – FUJIFILM North America Corporation today announced the new FUJINON XF8-16mmF2.8 R LM WR Lens, an ultra-wide angle zoom lens with a constant maximum aperture of F2.8 and focal length equivalent to 12-24mm (35mm format). 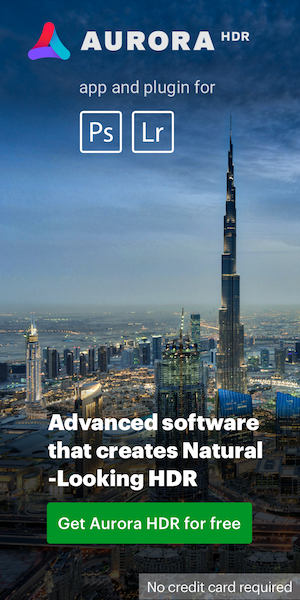 Capable of providingoutstanding edge to edge image-resolving performance, this lens is perfect for landscape and architecture photography such as interior and nightscape, and astrophotography. Also announced today is the new FUJINON XF200mmF2 R LM OIS WR Telephoto Lens, the first super-fast telephoto lens in the XF lens lineup, offering a fast maximum aperture of F2.0 and a focal length equivalent to 305mm (35mm format). This lens boasts exceptional image clarity with the ability to produce beautiful bokeh, making it an ideal lens for shooting sports and wildlife. The XF200mmF2 R LM OIS WR lens will only be available as a kit, paired with the high performance XF1.4X TC F2 WR Teleconverter to extend the focal length by 1.4 times to cover a focal length equivalent to 427mm at F2.8 (35mm format). 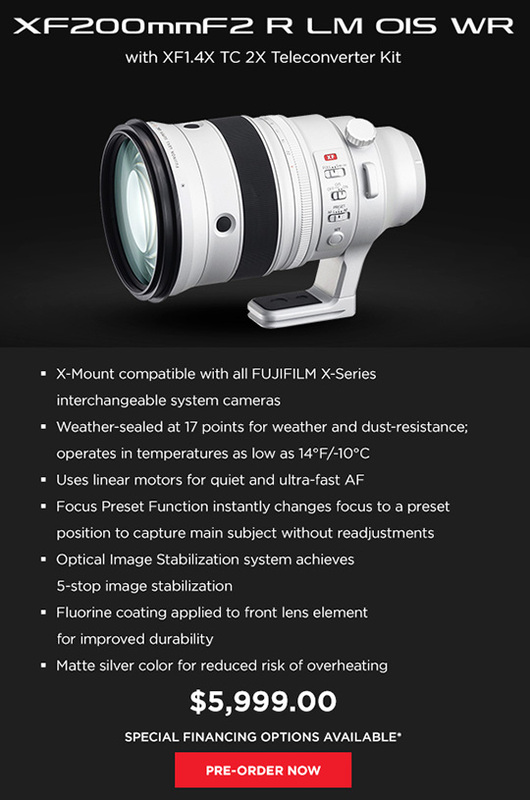 The new XF8-16mmF2.8 R LM WR features an optical construction of 20 elements in 13 groups, including 4 aspherical lens elements to control distortion and spherical aberration, and 6 ED lens elements including 3 super ED elements to control lateral chromatic aberration, a lens design that produces advanced image-resolving performances across the entire zoom range. Featuring a floating lens element that adjusts according to the position of the zoom, the XF8-16mmF2.8 R LM WR achieves edge-to-edge sharpness, and corrects field curvature that is typically found in ultra-wide angle lenses. The lens barrel is lightweight yet robust, sealed at 11 points, designed to be weather and dust-resistantand capable of operating in temperatures as low as 14°F/-10°C. Utilizing linear motors, the XF200mmF2 R LM OIS WR achieves fast, silent and high-precision AF performance, and also features a new mechanism that fixes the motor group when the camera is not in use to reduce movement of the focusing group. In addition, the lens offers 5-stop image stabilization performance that recognizes shooting conditions and automatically applies optimum image stabilization control. With magnesium alloy construction, the lens is lightweight yet robust, and is sealed at 17 points and designed to be weather and dust-resistant, and operates in temperatures as low as 14°F/-10°C. Also announced is the latest development roadmap of interchangeable lenses for the X Series line of mirrorless digital cameras. The latest roadmap adds three new lenses to the lineup: a compact wide angle lens, XF16mmF2.8 R WR, perfect for landscape and travel photography; a standard zoom lens, XF16-80mmF4 R OIS WR, which boasts a 5x zoom range with a broad focal range, providing a versatile lens capable of covering a wide range of shooting scenarios; and a large aperture prime lens XF33mmF1 R WR, an ultra-fast lens that stands to be the first mirrorless lens with a maximum aperture of F1.0 with AF capability. With the expansion of the high performance X Mount lens lineup, Fujifilm continues to cover more focal lengths to support a wide range of photography styles and shooting scenarios. The new FUJINON XF8-16mmF2.8 R LM WR Lens will be available in late November 2018 in the U.S. and Canada for USD $1,999.95 and CAD $ 2,599.99. The new FUJINON XF200mmF2 R LM OIS WR Lens and FUJINON XF1.4X TC F2 WR Teleconverter Kit will be available in late October 2018 in the U.S. and Canada for USD $5,999.95 and CAD $ 7,799.99. 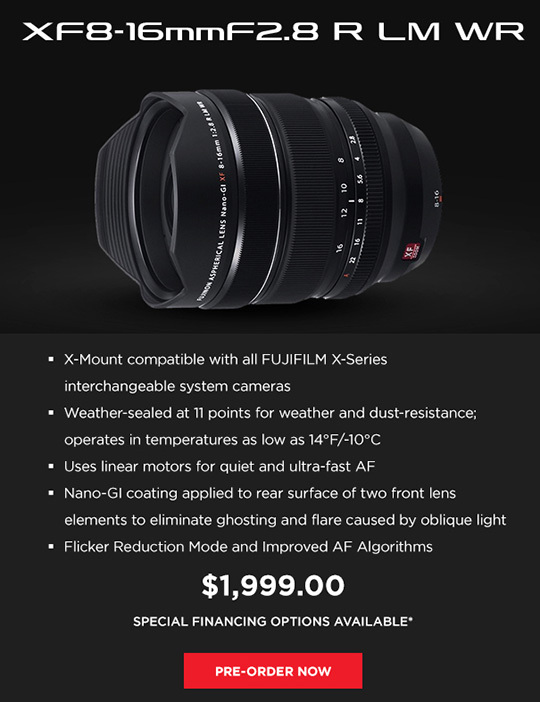 This entry was posted in Fuji and tagged Fuji Fujinon XF 200mm f/2 R LM OIS WR, Fuji Fujinon XF 8-16mm f/2.8 R LM WR lens. Bookmark the permalink. Trackbacks are closed, but you can post a comment.